So, this week was about not reading. Don't get me wrong, I'm plugging away with my reading (I'm currently in the midst of Sarah Dunant's Blood and Beauty! 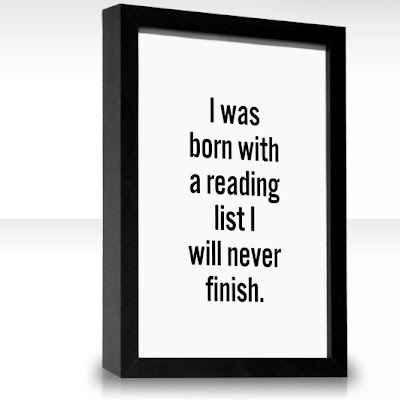 ), but there have been two developments that involve "not reading" that came up this week. First of all, I am that person who has a really, really hard time putting down a put once I start, no matter how little I am enjoying it. Well, I started this week knowing that I was chomping at the bit to read Blood and Beauty (it was my last library book for a while--see below) and knowing that I should get on this month's book club selection. So, my plan was to try to read them both--alternating between each book. Well, I got about halfway into the introduction of the book club book and thought, "I really don't want to be reading this! I want to read my other book!" and, well, that was that. I put the book club book aside and went right for the Sarah Dunant's latest. I'm still planning to go to my book club this month and will readily admit that I haven't read the book. And, who knows, I may read the book in the future--depending on what my book club thinks of it. Okay, not reading point #2. Jennifer over at The Relentless Reader posted last week that she is going on a book fast for August. Basically, she won't be buying any new books and she won't checking any books out of the library. In the meantime, she'll be chipping away at her TBR piles in an effort to catch up. I read this and thought, "GENIUS!" and jumped on the bandwagon myself. I actually purchase very few books, so that is not an issue. I do receive books for reviews and from giveaways, and that will happen as it happens, but the library books need to be controlled! However, I am in such a state that I've extended my "book fast" through September. During that time, I won't be purchasing any books (again, that is not a big deal) nor will I be checking out any books for myself during that time. I will still be checking out books for my kids and DVD's for myself, but no books. I can renew the ones I currently have (if they renew--most of them probably have other people waiting for them), but nothing new. Also, our library system is set up so that I can "suspend" my requests instead of canceling them. So, I took the requests I currently have and staggered them out from October on. And, any new books for myself that I want to request, will have to be scheduled out into 2014. So, this week past week was a little quiet on this blog and I think the next week or so may be the same. I don't have any more scheduled reviews until next month, so I'm just reviewing books as I read them at this point. I'll still do my "regular" posts on Tuesday, Saturday, and Sunday--and, hopefully, at least one more review in there somewhere. I'm chipping away at these piles :) So far, so good! It's not easy to STOP buying/checking out/requesting books but I'm making it happen! Goooood luck! Jennifer is very influential. I follow her blog too. She's a good one to have influence you, I think...well, except for that...;) <-- Totally kidding, Jennifer. Oh that sign sooo fits me! I don't purchase books too often and haven't been to the library in a few years. I should visit -- but I sure don't need to pick up any more books. I have tons of books collected from favorite authors that have languished as I review "new" releases and review requests. I certainly set aside a month to take no NetGalley books or Audiobook Jukebox audios. That would be hard to do though. And I already have a queue full of unanswered review requests that doesn't help my TBR status. I did good for a few months slipping in a TBR favorite or won book or free for Kindle book each month. That got a dozen or so read so far. But then I was getting books mailed that I hadn't even requested but felt compelled to read as the publishers are so generous ... and the books are interesting. :-) I will never catch up so I can't stress over it. I just keep plugging on! Good luck in tackling your TBR. My TBR collection and I are in an ongoing battle. I could really use a month or two or three like this. I always intend to, but it rarely works out. I have little impulse control when it comes to books. I buy a lot fewer books than I once did though--so that's good. But NetGalley and Edelweiss have been my downfall . . . I'm trying to avoid the two sites for the time being. We'll see how that goes. Scientists should be working on this problem. I hope they are.